We have over 12 combined years of triathlon racing & training experience. Coach Helen swam and ran competitively growing up and was a collegiate swimmer. Coach Domenick is a former semi-pro football player and experienced in various martial arts with a black belt in TaeKwonDo. Coach Dom has lost over 85 lbs. since getting involved in this new lifestyle & can help you with your weight loss goals. Coach Helen is a busy mom who knows the importance of making time for staying active and healthy. We have experience with Ironmans, Ultras, Leadville ultra, long distance swims, off road triathlons, all the way down to sprint triathlons and running races. 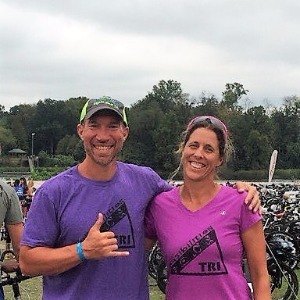 Coach Dom is certified by USAT and USA Cycling, and an IRONMAN Certified Coach, along with being an All World Silver athlete who wins in regional races throughout the country and is one of the Gulf Coast's top cyclists. Dom is a former teacher & coach of multiple youth sports, and Helen was a lifeguard and swim coach/instructor during high school and college. Coach Helen is certified by USAT and US Masters Swimming, along with being the USAT SE Regional Champion. She regularly wins in regional races throughout the country and is one of the area's top swimmers! Our motto is Finish Strong! By incorporating consistent functional strength training and optimal nutritional guidelines, we aim to build triathletes as opposed to simply providing coaching. We also believe that true life balance provides a critical foundation so that athletes can reach their full potential while incorporating training into their daily lives. Our athletes enjoy the cameraderie that comes from being a part of the TriPossibilities team, and we encourage them to build lasting friendships and learn from each other in group settings and training sessions. We welcome a wide range of triathletes, from beginners, to intermediate, to advanced athletes. Come join our team and explore the Tri Possibilities! We accept beginners, intermediate, and advanced athletes. Each athlete in this sport has the potential to make gains, so we treat each person as individuals with individual goals. Let's talk! Success. Coach Domenick Risola & Helen Cain has been notified of your message.